As mentioned in my last blog entry my wife and I visited South Australia in October of last year. After visiting Adelaide we then spent a few days on Kangaroo Island (KI). On our way to catching the ferry to KI we first stopped at The Book Room in Myponga. Ian has been running this store (next to The Spare Room) since March 2016. There's plenty of books for sale so it's a great place to pickup a holiday read prior to travelling to KI. 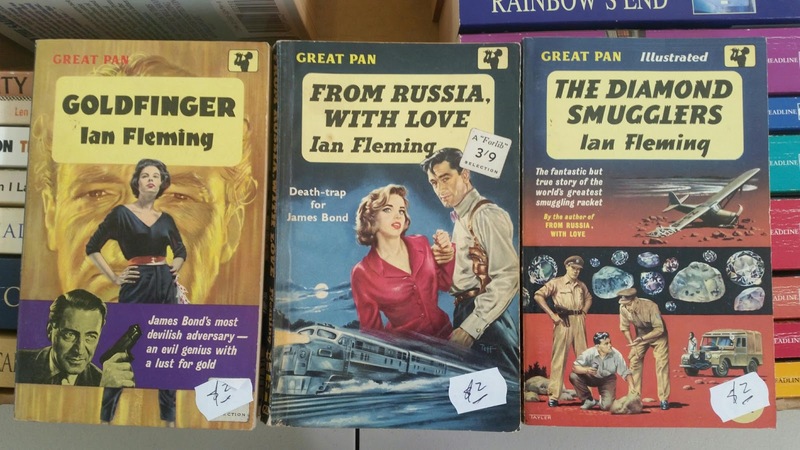 On this day I picked up these three Ian Fleming Great Pans which were in excellent condition. 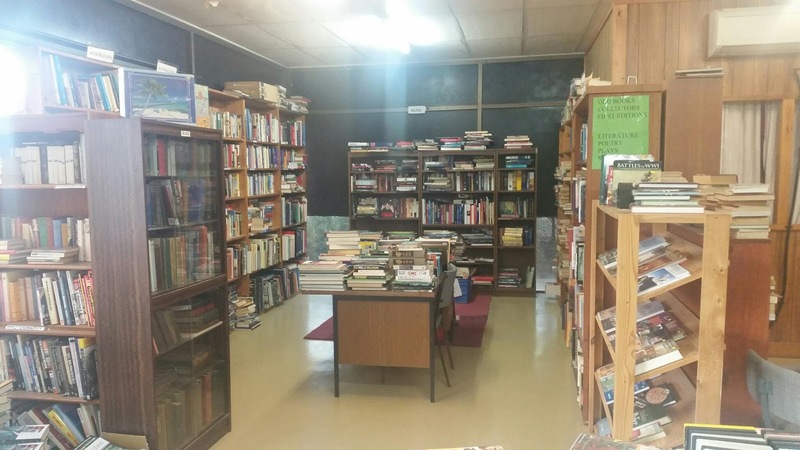 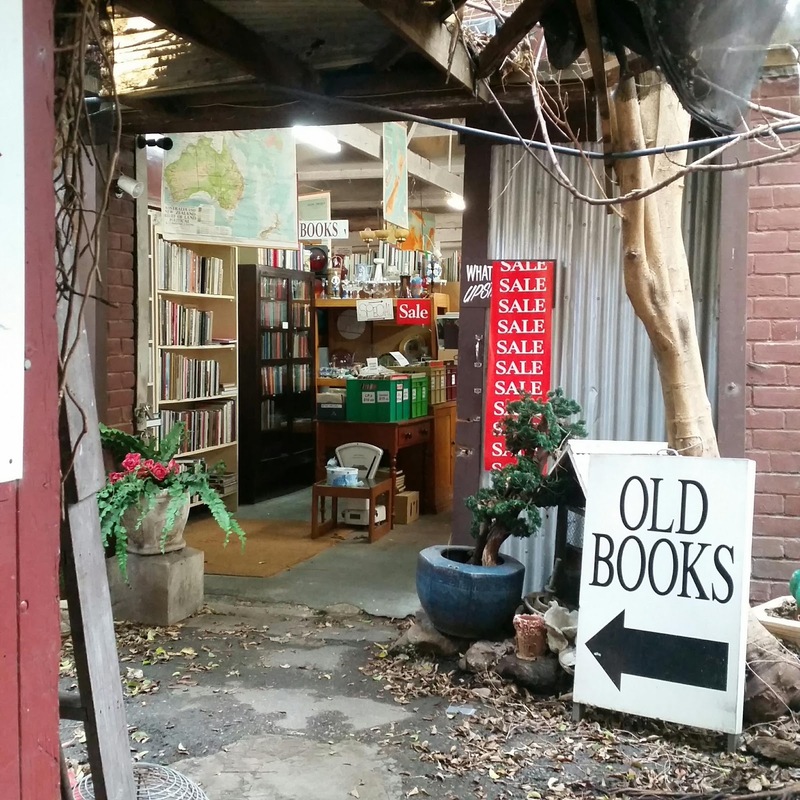 Next stop was Yankalilla Book Exchange, another book store to pick up some great holiday reading. 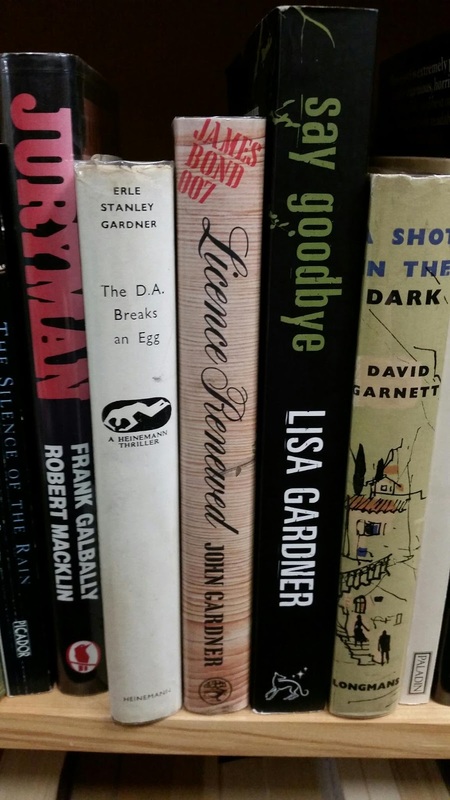 Plenty of books in the back room but on the day I visited there were no Bonds. 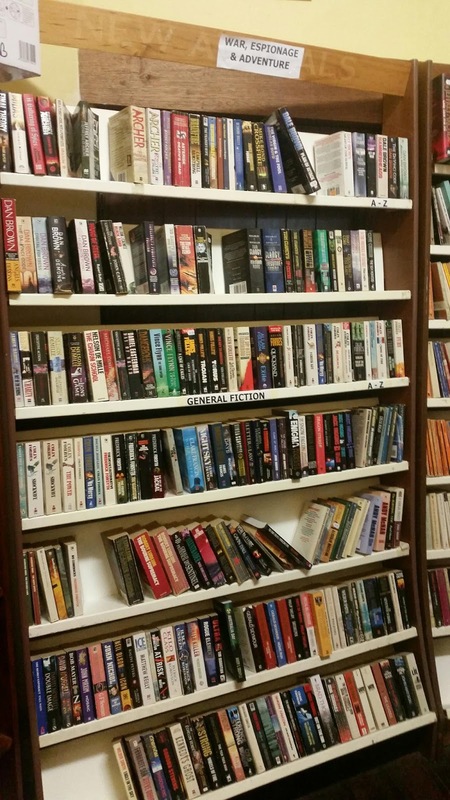 It's good to see a book exchange still around. 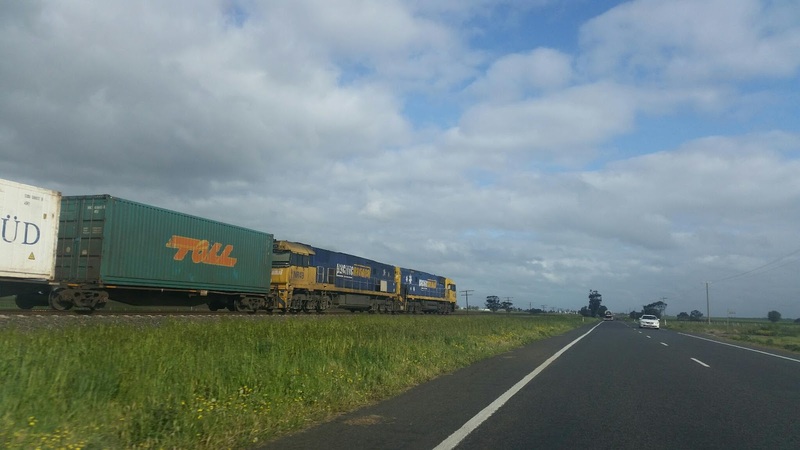 I don't see many of these in Melbourne anymore. 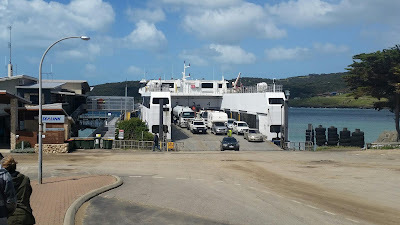 We continued on toward Cape Jervis and easily made it in time to catch the ferry to KI. We spent two nights on Kangaroo Island and found it very relaxing. There are so many beautiful sights it would have been easy to have spent a week there. The weather was great too. After returning from KI we spent another night in Adelaide before beginning the drive home. 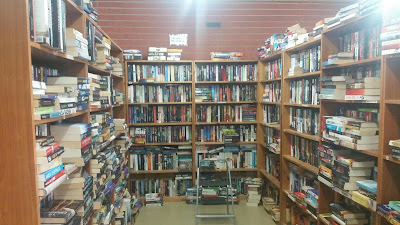 First stop was Chapter Two Books in Stirling, the Adelaide Hills. It's a nice little store with quality books. 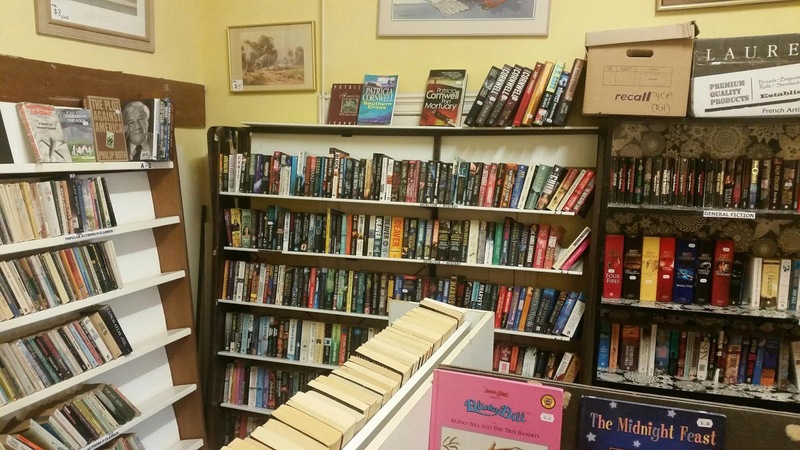 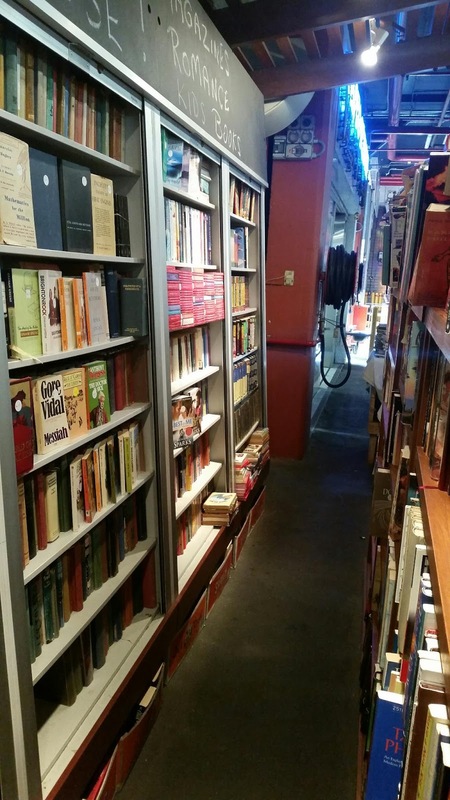 Just a few minutes walk away is The Book Shed. 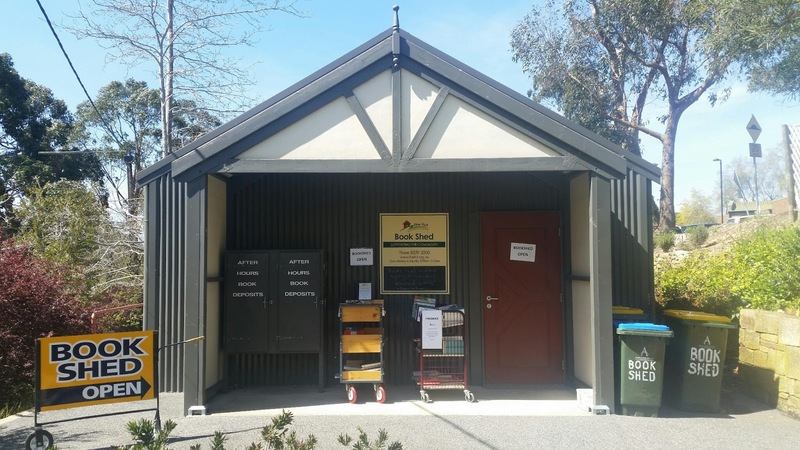 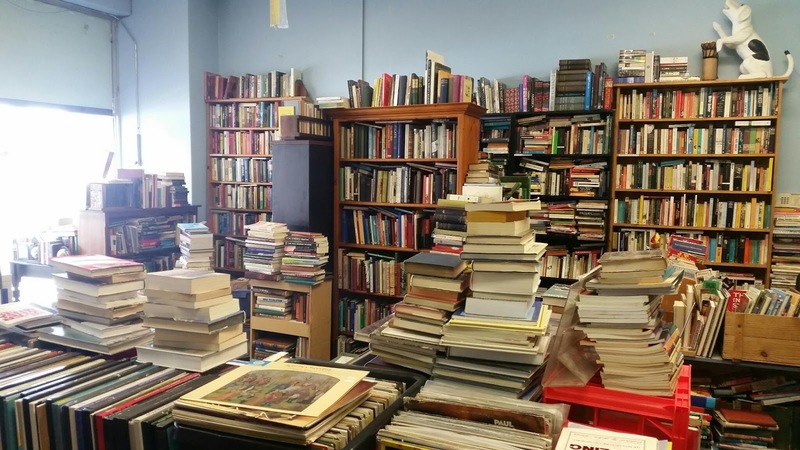 This "shed" contains a huge range of second hand books. 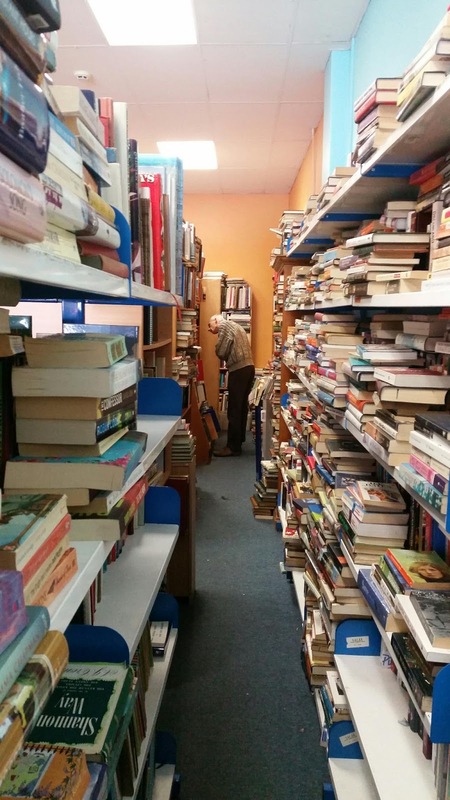 They're all really well organised on aisles of shelves that seem to go on forever. 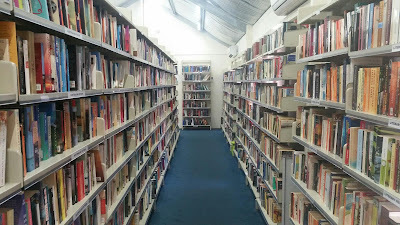 This is the second time I've been here and every time I walk in I have to remember I'm not in a library ! 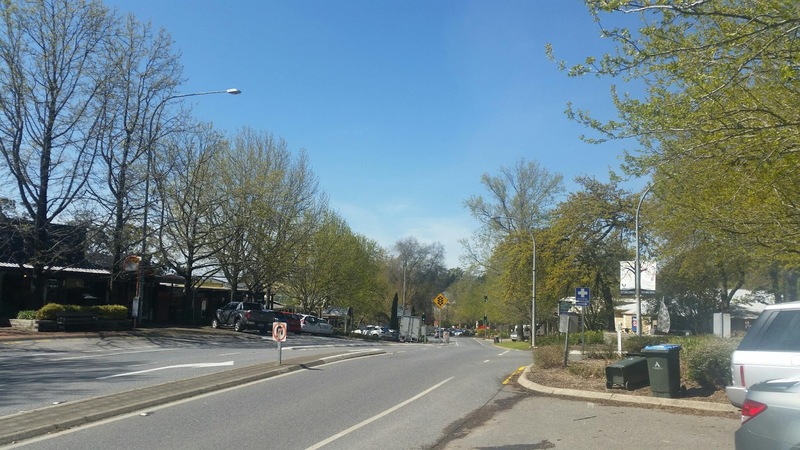 Here's a snap from the car as we were driving home via the Western Hwy. On our way from Melbourne to Adelaide we passed Ararat Books And Collectables but didn't have time to stop. 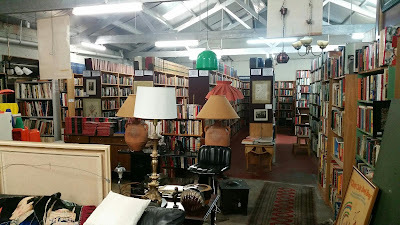 However on our return journey, with a little more time up our sleeves, we were able to stop and take a look inside. 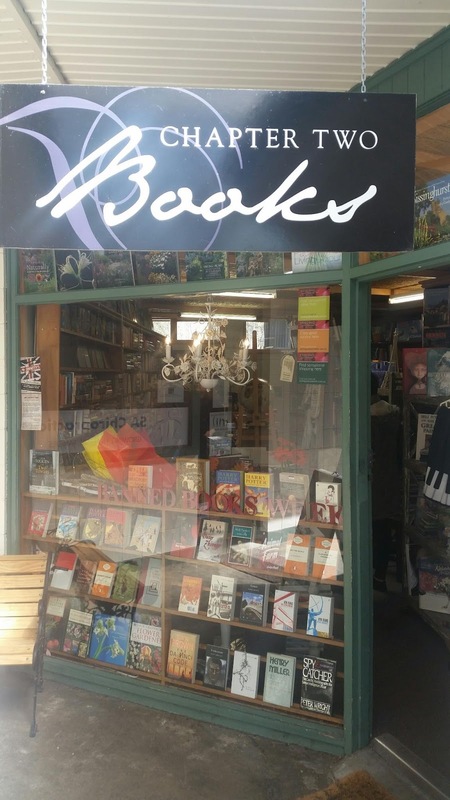 Marion, the owner, wasn't there at the time but her husband was. We spoke for a while about the many books (and records) they were selling, and I bought two books: a Jonathan Cape "Thrilling Cities" by Ian Fleming with a really nice pink spine, and "The Man Who Saved Britain" by Simon Winder. 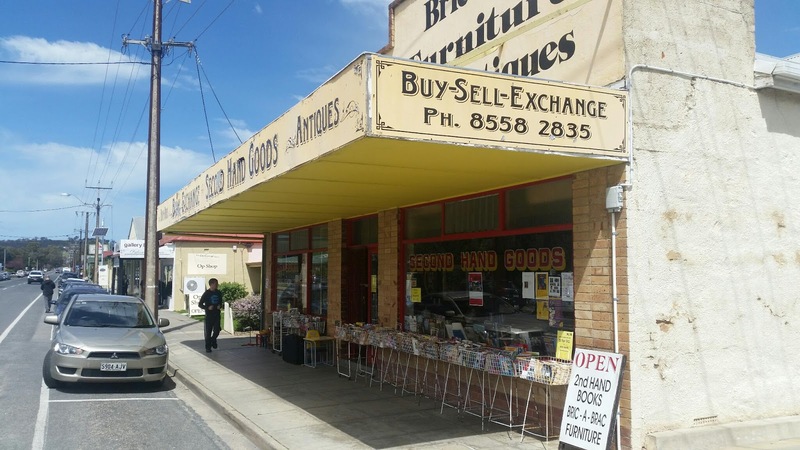 If you're travelling between Melbourne and Adelaide anytime in the future be sure to allocate time for a stop at this store in Ararat. 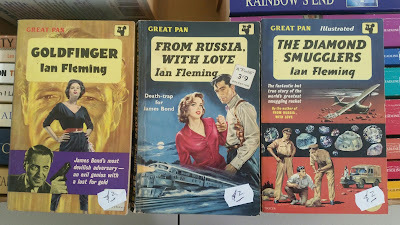 It may prove very worthwhile for you too. 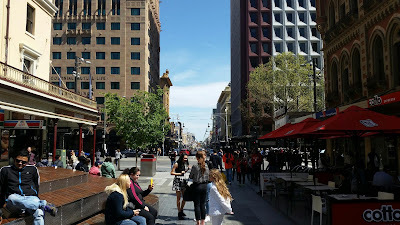 Our trip to South Australia was five months ago now but my wife and I still talk about it often. 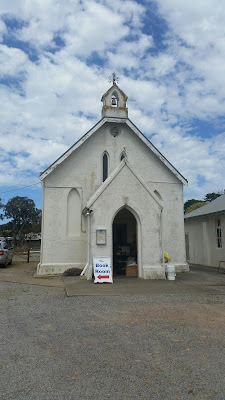 If you ever go to Kangaroo Island, don't stay for just two nights. 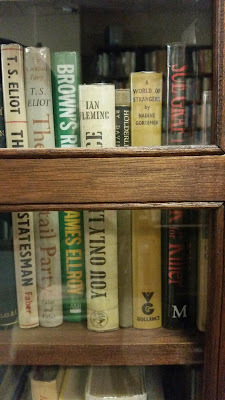 It deserves at least three... no four nights. 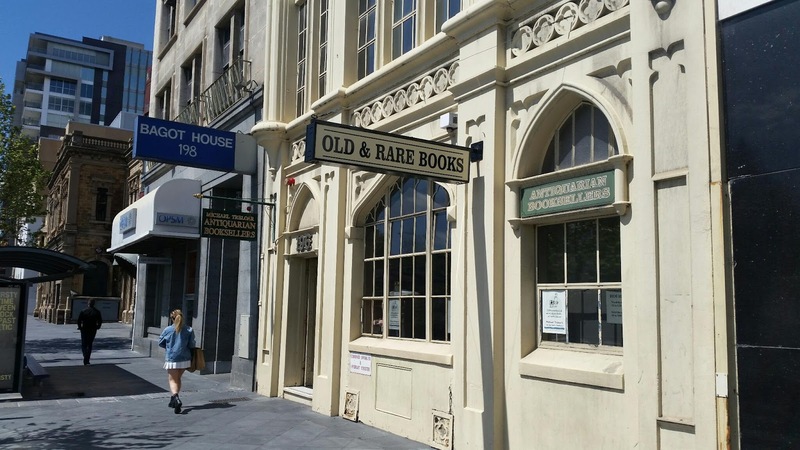 And Adelaide is a book collectors delight. 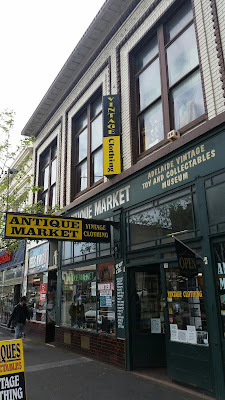 I highly recommend visiting all the stores mentioned in this and the previous blog entries too. 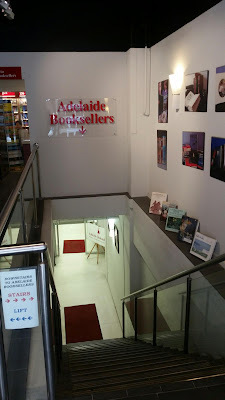 BTW: If you're interested this wasn't our first trip to South Australia. Here's a blog entry I wrote in September 2012 about our first visit. 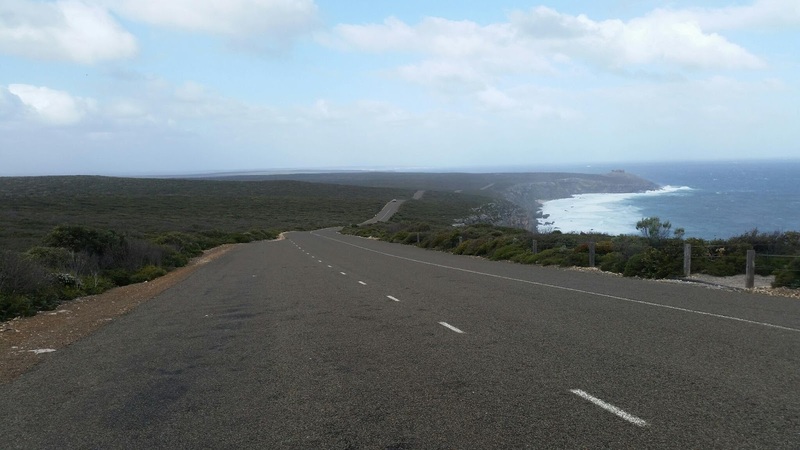 Back in October of last year my wife and I drove to South Australia for a short holiday. 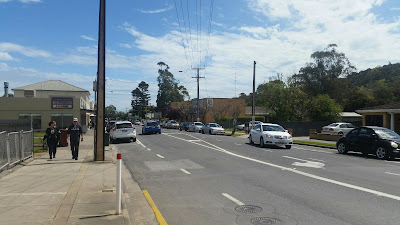 The trip took 8 hours and when we arrived in Adelaide there had been a major storm the night before and the power to the City had only just been restored. 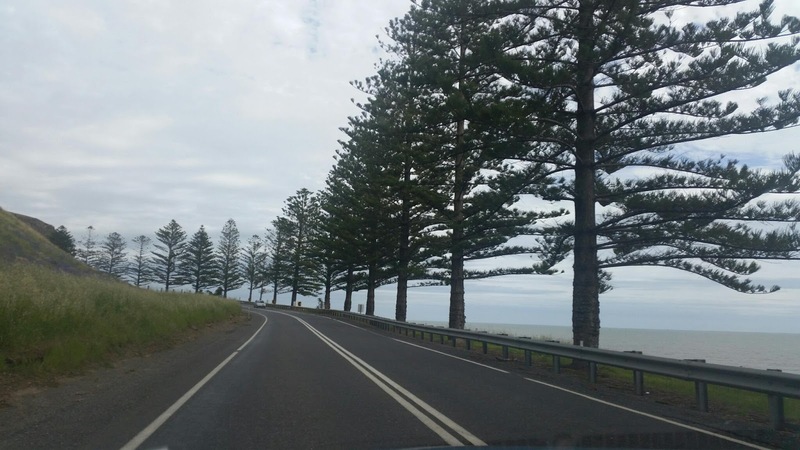 Fortunately during our entire holiday we didn't encounter any of this bad weather so we were very lucky. 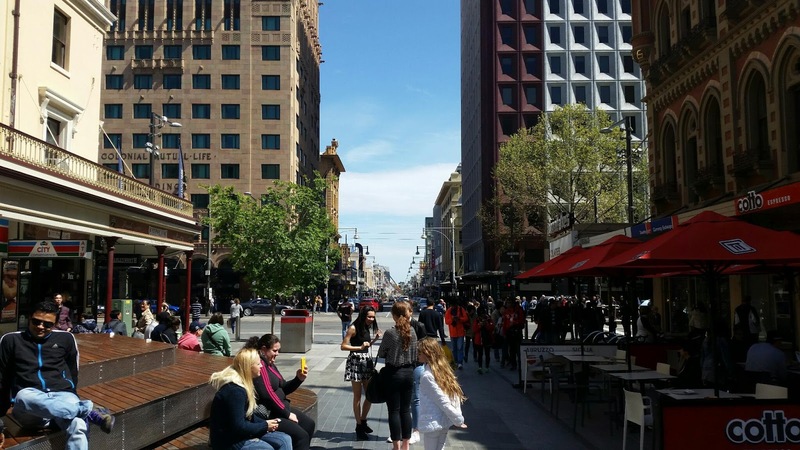 Our hotel was located just near Rundle Mall which had plenty of fine shops for my wife to visit. 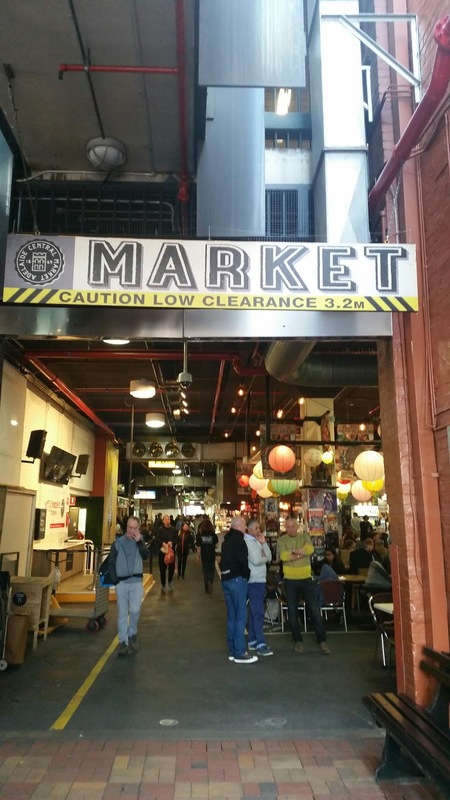 While walking around this beautiful City we visited Adelaide Central Market. 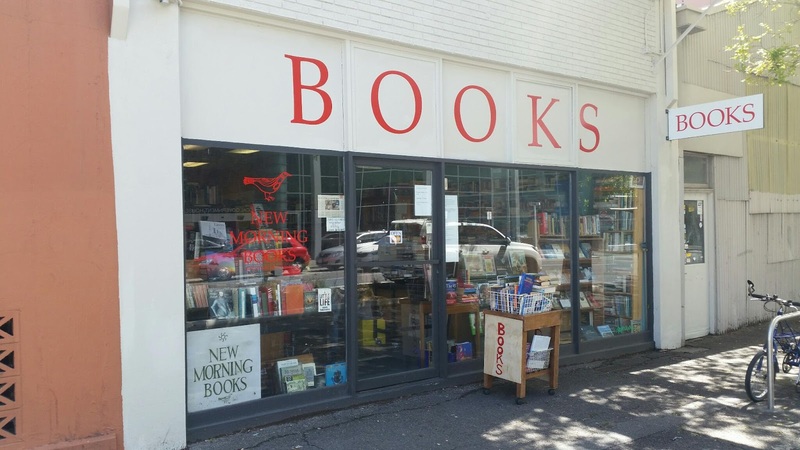 This is the location of Central Market Books and the owner's name is Barry. 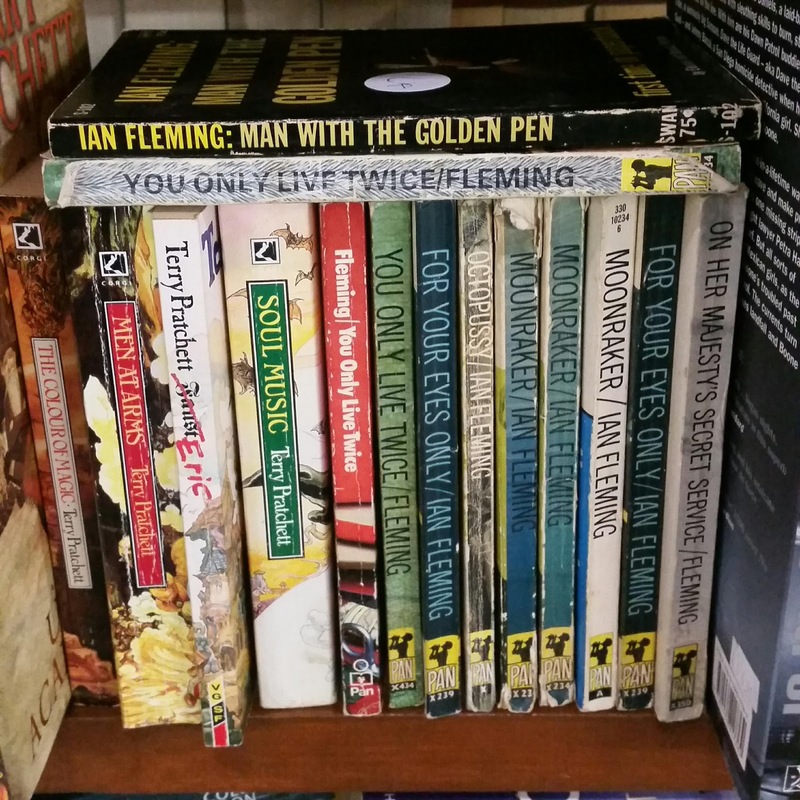 I spoke to him for a while and then checked out the James Bond books on his shelves and ended up purchasing two. 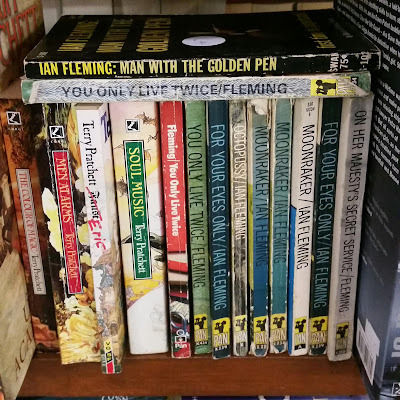 One was "Ian Fleming: The Man With The Golden Pen" by Richard Gant. 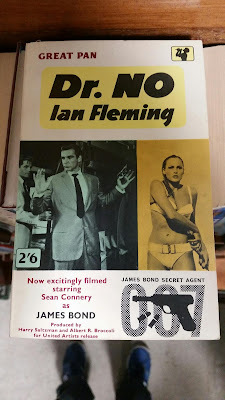 I'd seen this book before but I didn't have this particular copy. 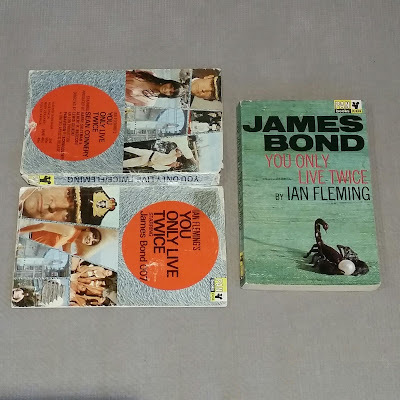 The second book was a Pan copy of "You Only Live Twice" by Ian Fleming covered in the rare movie tie-in dust wrapper. 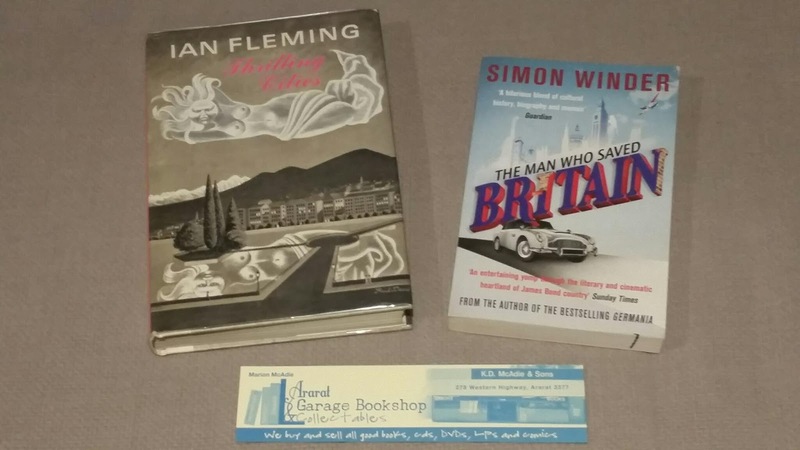 The wrapper wasn't in great condition but still a great purchase none-the-less. 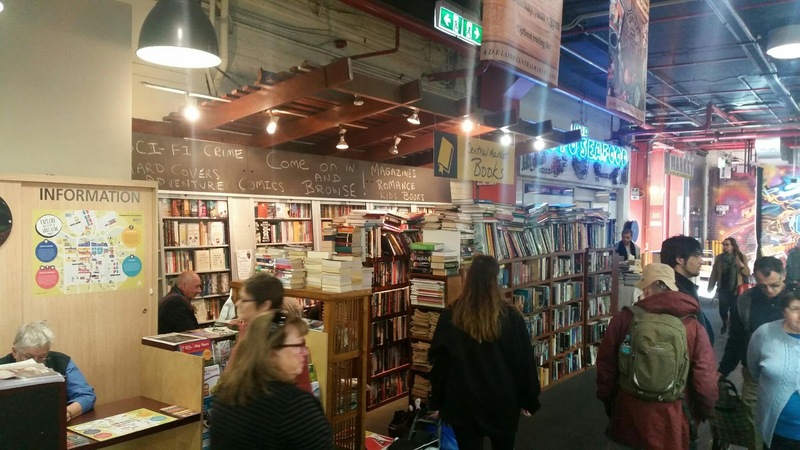 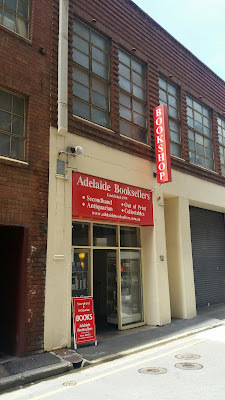 We then continued walking around the busy market and came across another second-hand book store named Adelaide's Pop-Up Bookshop. 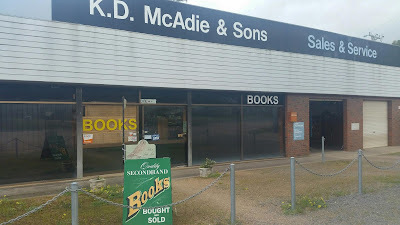 The owners were really nice and very informative. I ended up purchasing a Pan Books "Casino Royale" by Ian Fleming (second edition) and a Jonathan Cape copy of "The James Bond Dossier" by Kingsley Amis. Leaving Central Market we then made our way to Michael Treloar Antiquarian Booksellers. 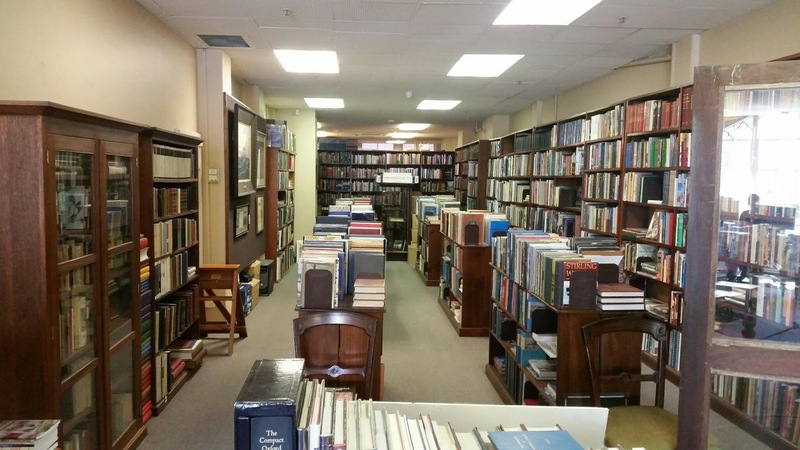 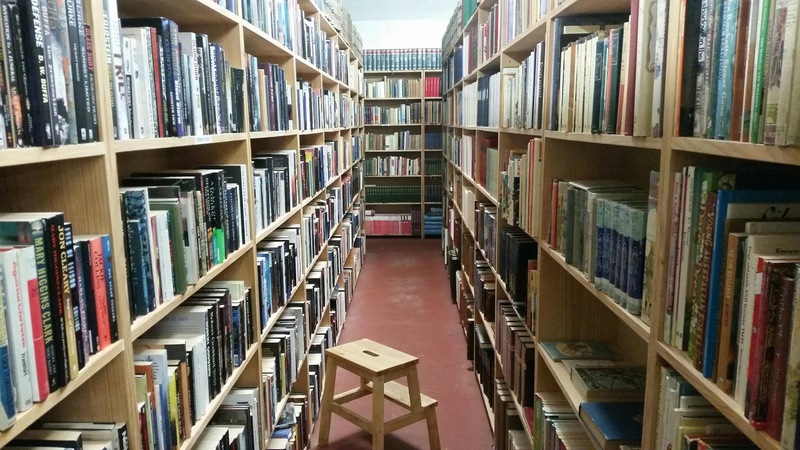 This is a really well maintained book store with lots of rare books. 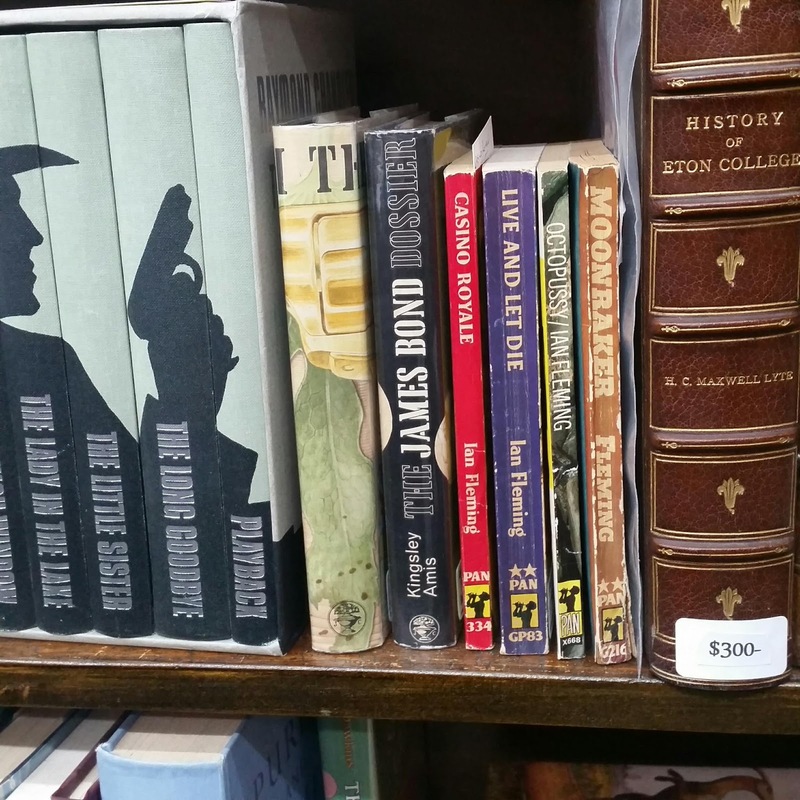 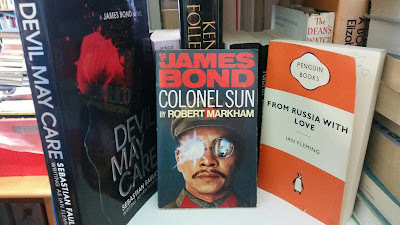 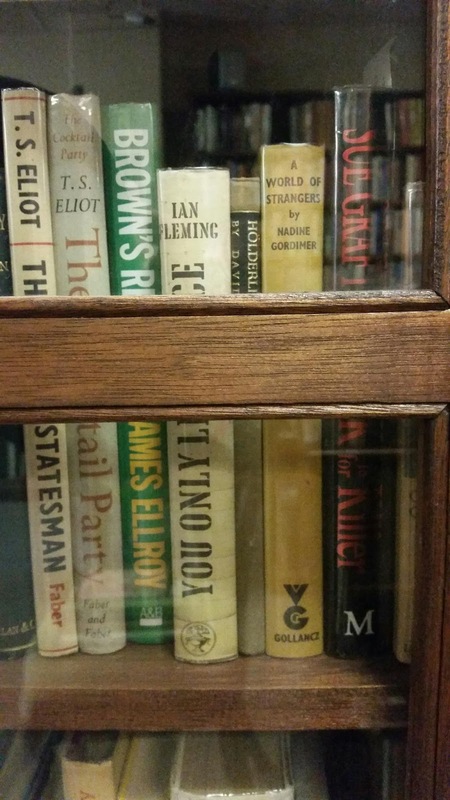 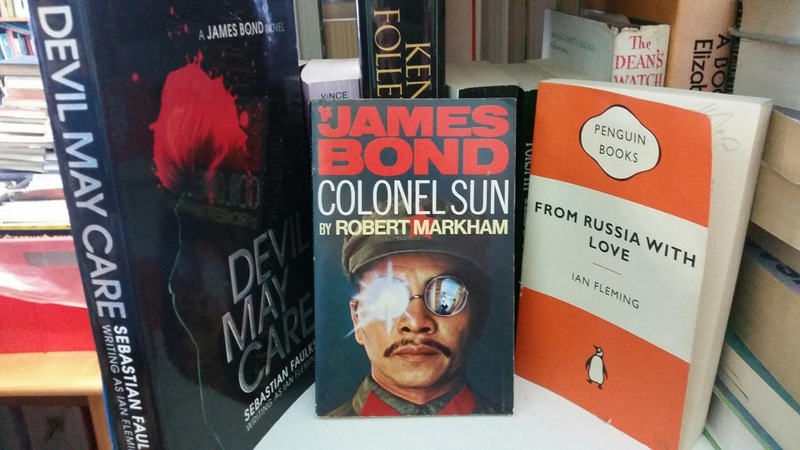 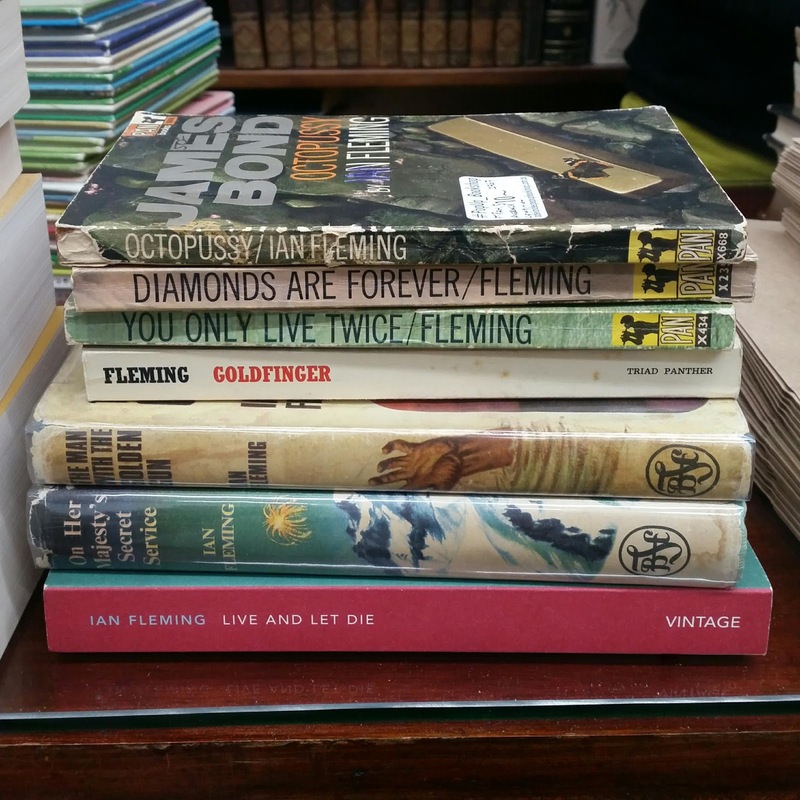 I spoke to one of the gentleman behind the counter and was informed that the only Fleming they currently had on their shelves was a Jonathan Cape first edition of "You Only Live Twice". 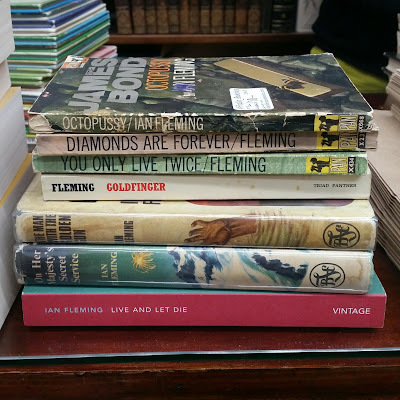 It was a nice copy but I let it go. 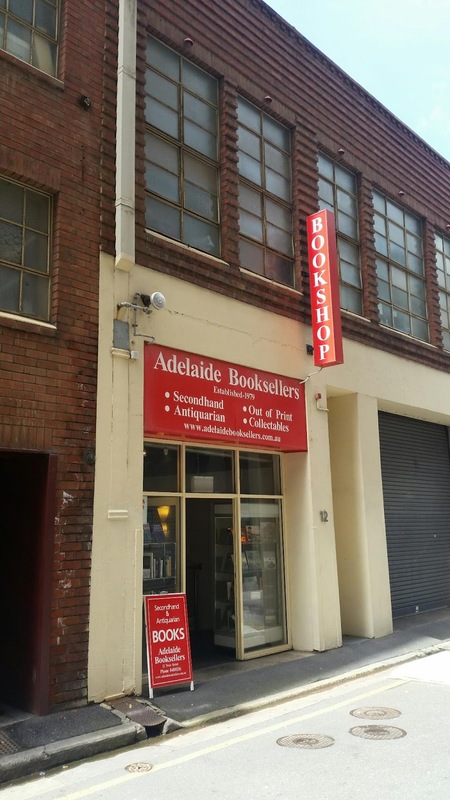 Just five minutes walk from Michael Treloar's store is Adelaide Booksellers. On entering the doorway there are stairs to the right which lead down to a subterranean basement. The store is really clean and well organised, however there were no James Bond books on this visit. 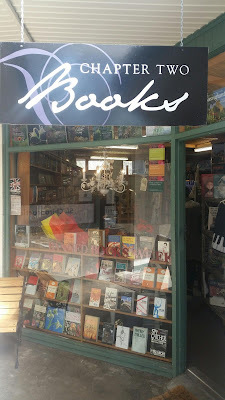 And as is the owner's prerogative, on asking if I could take some photos of his store he replied "No", so I could only take these photos below. 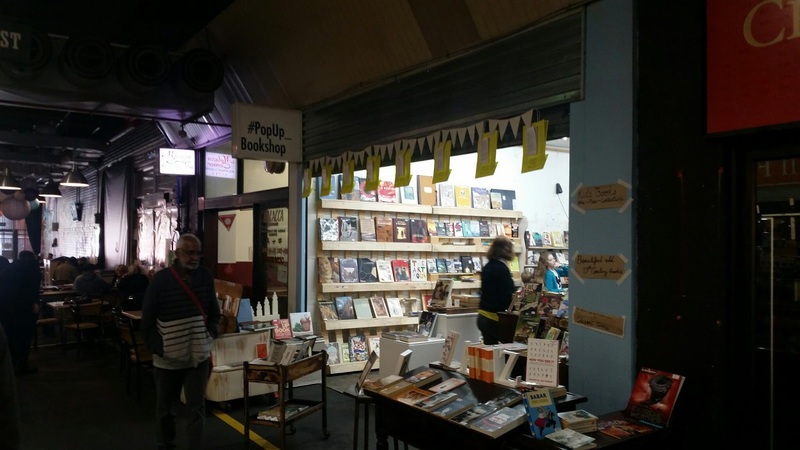 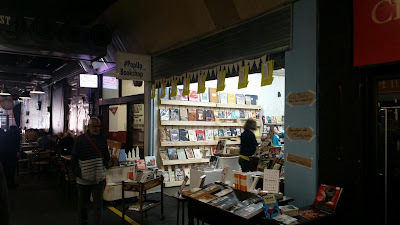 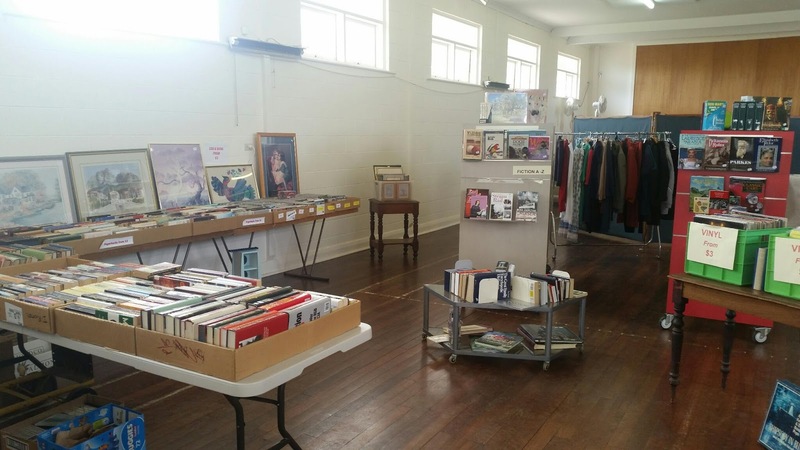 New Morning Books is only a short walk from Adelaide Central Market and is well worth a visit. 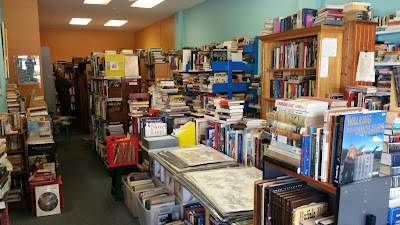 There are loads of books, all well priced and the books cover a huge range of subjects. I managed to find the three James Bond novels shown below. This is definitely the type of store where anything could be lurking in a wrong spot on a shelf so it took us a while before we finally left. 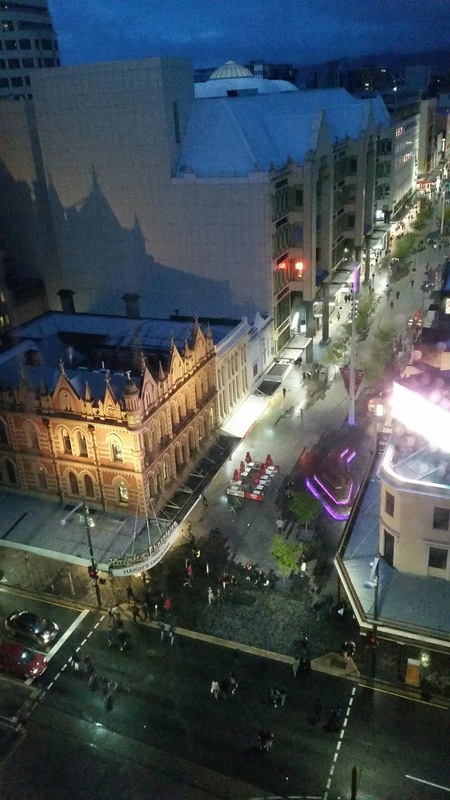 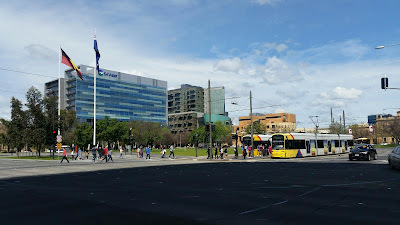 A photo of central Adelaide including the tram to Glenelg. 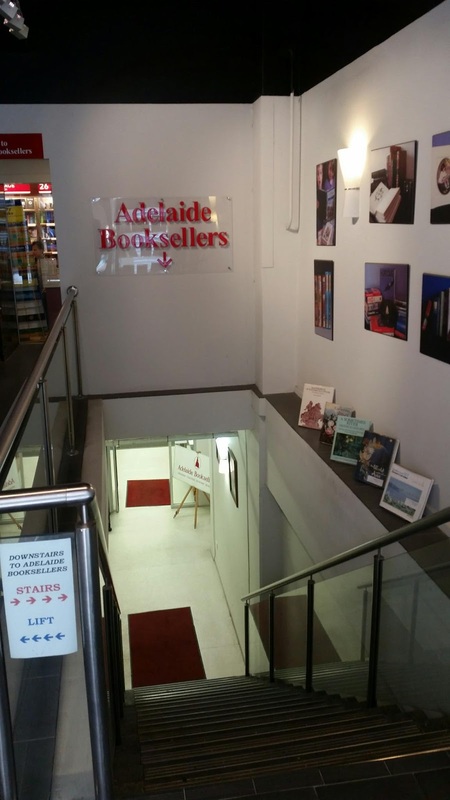 Our walk in Adelaide literally went full circle. We ended up at the Antique Market directly over the road from the Central Market where we'd started. As usual there were a lot of books in the back room (somehow this store is linked to Michael Treloar's store I believe) and I ended up purchasing this really nice copy of the Pan movie-tie in of "Dr. No" from 1962. 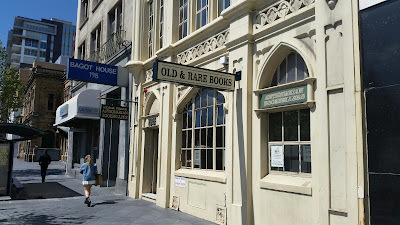 There ended our book walk of Adelaide. I've got to say it's a great city to visit. 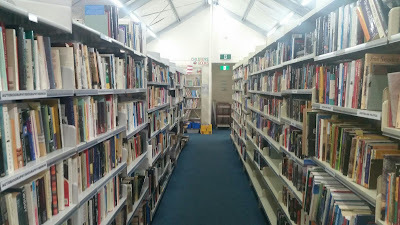 It's very quiet, relaxed and has some interesting old architecture. 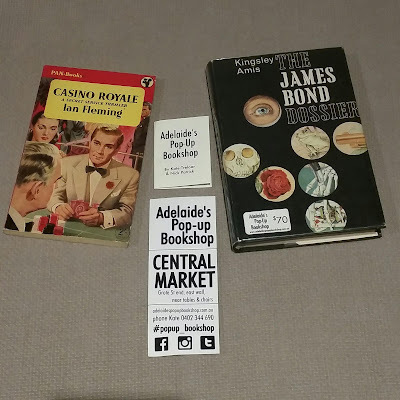 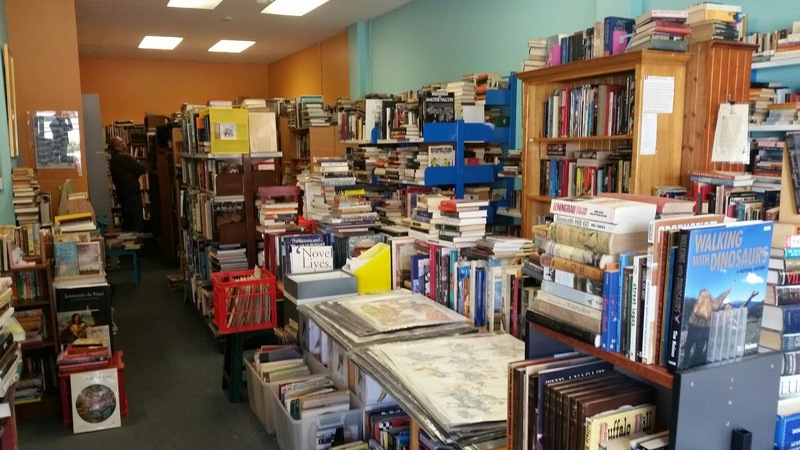 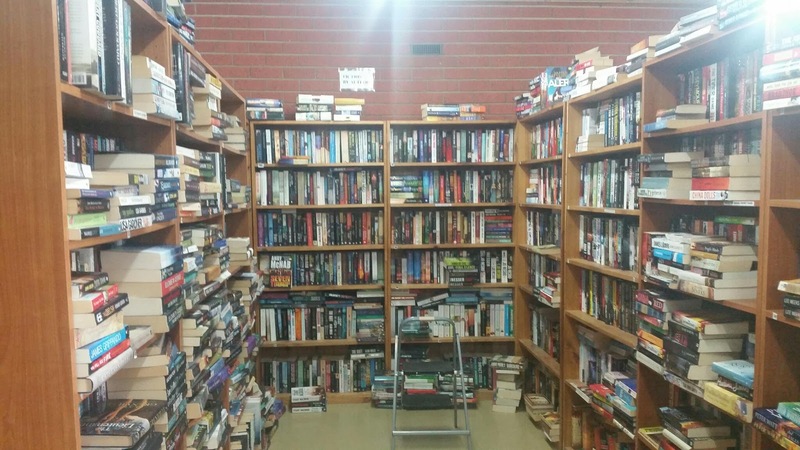 My wife and I then drove to Kangaroo Island and visited some other towns and second-hand book stores in South Australia which are detailed in Part 2.